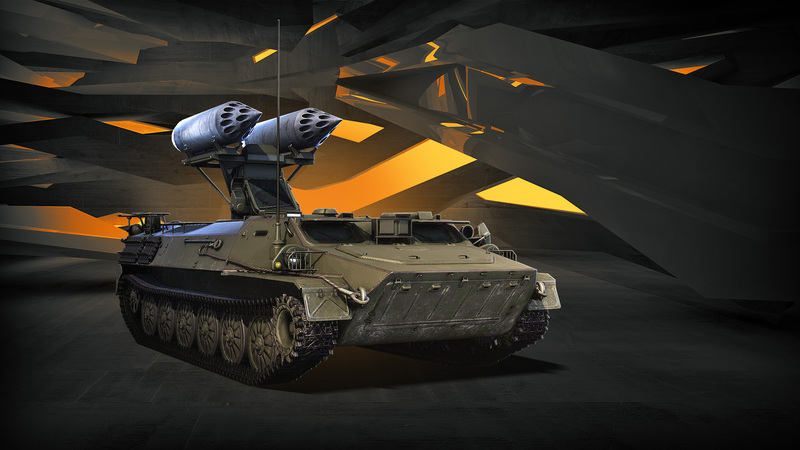 Recently, Armored Warfare unveiled a rather interesting Tier 6 Armored Fighting Vehicle called Strela (“Arrow” in Russian) – a combination of an older surface-to-air missile carrier and rocket pods, painstakingly combined to create an unorthodox, if original, rocket launcher. Apart from being quite unique gameplay-wise, this vehicle has the honor of being the first Ukrainian vehicle in the game. The Strela-10 RSZO (MLRS) was unveiled only recently as the means for Ukraine to combine two items they did not need by themselves in order to use them effectively during the Civil War. The first one, not quite useful to the Ukrainians by itself, is the Strela-10 self-propelled SAM – its deployment is quite limited due to the fact that the separatist forces do not have any air force. The second item is an aircraft or helicopter rocket pod that is used to fire 80mm S-8 unguided rockets. Together, they form an ad-hoc rocket launcher. In Armored Warfare, the Strela-10 S-8 (or MTLB S-8, as it is also called) is a unique Tier 6 Armored Fighting Vehicle. What makes it stand out? Its armament, of course. This AFV does not have a lot of armor, nor is it incredibly fast, but it can fire its two full rocket pods (each has 20 rockets) within 30 seconds or less. The rockets have HEAT-MP projectiles and are absolutely deadly against practically any target, but especially against those without composite armor. On the downside, the rockets are unguided and quite inaccurate. This vehicle is not for the faint of heart! Starting today, the Strela-10 S-8 is permanently available in the Web Shop, including for Gold. Apart from the standalone version, the following bundles are also available between May 1 and May 9, 2018. This bundle offers a standalone version of the Strela-10 S-8 Tier 6 Premium Armored Fighting Vehicle, either for currency or for Gold. Reading these is like reading a nostalgia piece in some museum magazine. It’s still a cool game. But the player base is withering everyday.